Considering a Personal Budget: In this guide we talk about who would benefit from a Personal Budget and how to make an application. Thinking about outcomes: This guide covers support planning for people with severe mental illness. Supporting your client through the process: This guide advises professionals on what support their clients need throughout the process of getting and managing a Personal Budget. Working with families: In this guide we highlight some things for professionals to think about when working with families of individuals considering and/or receiving a Personal Budget. Reviewing a personal budget: This guide describes how reviews work, their potential benefits and common concerns. Reaching goals and moving on: In this guide we talk about dealing and reaching the end of a Personal Budget. Family personal budgets in mental health: This booklet guides carers through the process of considering, getting, managing and reviewing a Personal Budget. Is a personal budget right for you? This guide helps people to consider whether or not they would benefit from a Personal Budget. Planning your support: In this guide we cover support planning and deciding what to use the budget for. Checking your progess: This guide discusses reviewing a Personal Budget, including why reviews are needed, how they work and how to prepare for them. The PEOPLE study was a three year project funded by the Big Lottery Fund and led by Rethink Mental Illness and the McPin Foundation, in partnership with the University of Birmingham and King’s College London. Understand the role of carers and family members in assisting people with SMI to negotiate challenges and opportunities offered by personalisation. The project has been guided throughout by a group of people with lived experience of mental health problems and with an interest in personalisation. This Lived Experience Advisory Panel has helped us to put together our data collection tools, to recruit people to the study, to gather local intelligence and to analyse our data. Personal budgets are being rolled out across the country with various degrees of success. The People Study focused on the impact of personalisation for people with a severe mental illness (SMI), a group which has received less attention than others in the implementation and evaluation of Personal Budgets and personalised care. People using mental health services can benefit from a greater choice and control over the support they receive from local authorities. Personalisation enables care co-ordinators to work with their clients in a person-centred way and allows the clients to have a lead role in support planning. 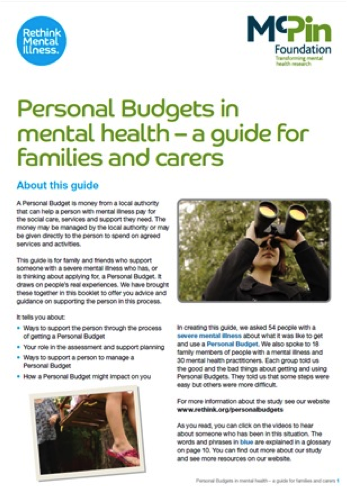 We used the findings from our research to develop three practical resources providing guidance to people who might be receiving or considering receiving a personal budget, their family members and mental health professionals. The project used a longitudinal case study approach based in four local authorities. The research was carried out over two main phases. In the first phase, we used a combination of observation and interviews with 58 key stakeholders, including representatives from the local authorities, the mental health trusts and third sector organisations. This phase explored the main challenges and facilitators to implementation of Personalisation for severe mental illness. Phase two consisted of in-depth interviews with three groups: people using mental health services, family members and care staff. – We interviewed 54 service users up to three times over the course of a year to provide a longitudinal perspective. All service user participants had either received, were in the process for receiving, or had been declined Personal Budgets or Direct Payments. 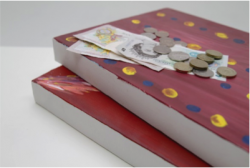 – We interviewed 20 family members and informal carers about their experiences of supporting someone with severe mental illness who received a Personal Budget. – We interviewed 30 key workers about their experiences of and views on Personal Budgets for their clients. We have now completed the study and are working on several academic papers presenting our findings. We will present our findings to different audiences, including people using services, their families and practitioners through presentations, reports, blog posts and peer-reviewed papers.